On October 10, 1845, fifty midshipmen and seven faculty attended the first term of The United States Naval School. Five years later, the school became the United States Naval Academy. From the Mexican War to the Persian Gulf War, officers trained at the Academy served in every major U.S. war. President Jimmy Carter holds the distinction of being the sole Naval Academy graduate elected president and commander in chief. At the turn of the century, the campus was rebuilt and expanded to reflect the importance of America's navy to the international policies of President Theodore Roosevelt. Today, 4000 men and women attend classes at the 338-acre campus. American Naval forces were organized to fight the British during the Revolutionary War. America's first naval hero, John Paul Jones, defeated a British fleet off the coast of England on September 23, 1779. As early as 1783, Jones proposed an academy for the education of naval midshipmen. However, the idea lacked congressional support. After independence from Great Britain, the Navy was disbanded in order to save money. The United States Naval Academy is an undergraduate college in Annapolis, Maryland, United States, that educates and commissions officers of the United States Navy and Marine Corps. The Academy often is referred to simply as "Annapolis." It is also called "The Academy," "The Boat School," or "Canoe U." Sports media refer to the Academy as Navy; this usage is officially endorsed. The U.S. Naval Academy was established 10 October 1845. 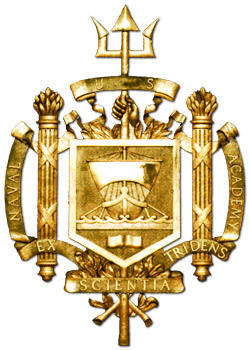 The Academy's motto is Ex Scientia Tridens, which is Latin for "from knowledge, seapower" (the trident, emblem of the Roman god Neptune, represents seapower). Today In History: Anchors Aweigh!